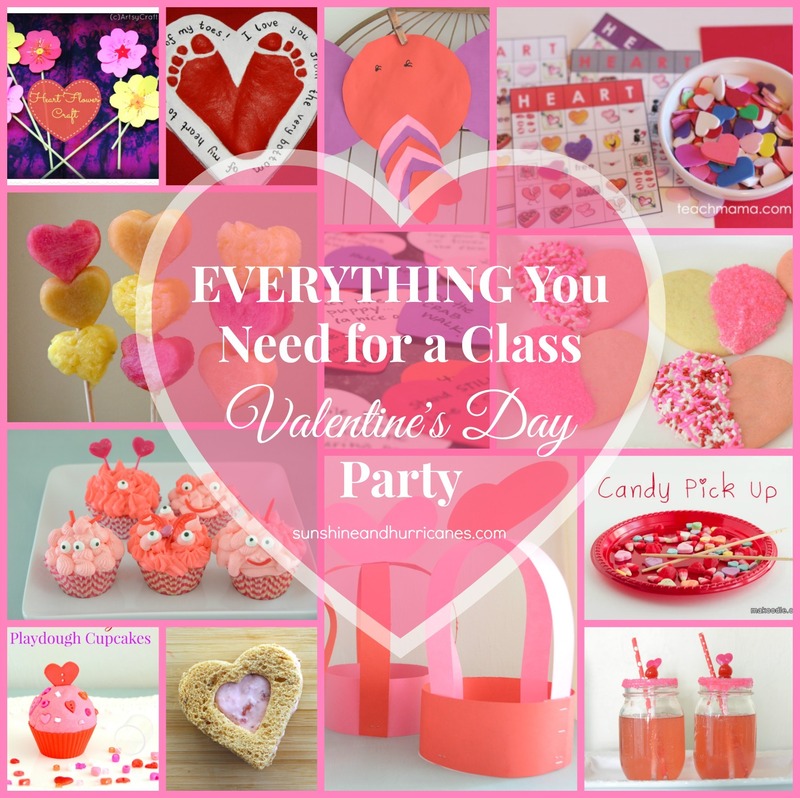 Whether you happily volunteered to help plan this year’s class Valentine’s party or you were roped into it out of guilt or by assignment, there is no reason to spend hours pulling it all together. We’ve done the hard work for you and found a whole seasonal selection of Valentine’s themed games, snacks and activities. 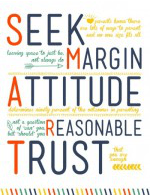 Pick and choose from the great ideas below or if you are a real go getter then feel free to try them all! Each one is sure to be a hit with pre-school and elementary aged children. Guaranteed to deliver BEST. PARTY. EVER. results! Healthy Strawberry Snacks: Several cute and clever ideas for healthier snack options that all include strawberries. Yummy! Fruit Kabobs: These simple to make Fruit Kabobs will be a big hit with the kiddos. It’s all in the delivery, and fruit on a stick = fun. Cupid’s Brew: A pink drink that is perfect for any Valentine’s Day party. NO soda and super easy to make (2 ingredients). Cuddle Monster Cupcakes: Aren’t these cupcakes totally adorable?! Use a box mix or our favorite cupcake recipe and get creative. Just a few supplies that are easy to get and you are good to go. White Chocolate Dipped Heart Cookies: These cookies are almost too pretty to eat (I said, “almost’). Use pre-made sugar cookie dough (or we provide a quick recipe), white chocolate chips and sprinkles. What’s not to love? Heart Bingo: Boxes of chocolate, candy hearts, kissy lips – get five in a row and you’ve got B-I-N-G-O!!! Such a simple game (printables included) and yet always popular for class parties. Musical Hearts Game: Dance to the music as you walk from Heart to Heart, when the music stops turn over the heart where you stand and follow the directions. Hop, Hula and Hug are just a few of the directions meant to get kids reading and moving while having a blast. Minute Win It Games: Let the giggles begin. These fast paced minute to win-it games like heart stack, candy-pick up and marshmallow toss will have kids testing their skills and silly Valentine’s challenges that will leave everyone laughing. Easy Kids Necklaces: Budget friendly and requiring mostly items easily found at Dollar Stores. This kid friendly jewelry is sure to charm. Paper Heart Animals: Who knew something as simple as combining large colored paper hearts with a little creativity could produce so much cuteness. Pink and Red Playdough Cupcakes: These eye-catching playdough cupcakes can be customized by each child to reflect their own Valentine’s Day style. They would also make excellent gifts. Valentine’s Day Crowns: A few strips of paper and a little imagination is all it takes to crown a king or queen of Valentine’s Day. Salt Dough Footprint Hearts: A perfect momento to send home for moms and dads. Precious little feet captured for all time as a reminder of how much “love” a child has for their parent. Paper Heart Flowers: Who wouldn’t love a beautiful bouquet of flowers homemade from the heart. Easy and low on the mess factor, these paper flowers will reveal the unique heart of the child that made them. These are such cute ideas! I especially love the little monster cupcakes. They are just so adorable! 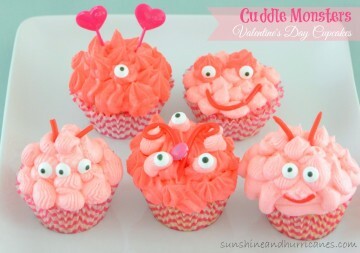 The cuddle monster cupcakes are adorable! Wowza! So many AWESOME ideas! The monster cupcakes are SO cute! Great V-Day round up. So many great ideas in one place! What great ideas!! Planning a party can be so stressful so it’s nice to have a great list all in one place! A lot of great ideas. 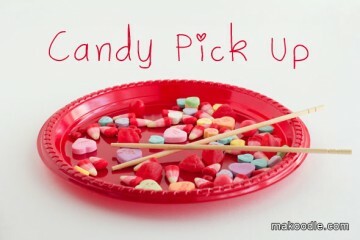 I think my kids would like the candy pick up. I love love love these ideas. These are all such amazing ideas! So fun! Love all these ideas! I think my favorite are the cupcakes and the cupid’s brew. I need to make my kids some cupid’s brew. I think they’d love it! These look like such fun activities for Valentine’s! so fun!! thanks for putting this all in one place. What a great resource!! So many great ideas all in one place! Such cute ideas!! I love them all!!! Such great ideas…where were you guys when my kids were little?! So many fun ideas! What a great little roundup! These are such cool ideas and so fun for kids! I have this set for our Twitter feed later this week. I’d love for our parents to try them out with their kids. Thanks for sharing! Well you’ve covered it all! What wonderful ideas for snacks and crafts!!! Love it! These are some great ideas! 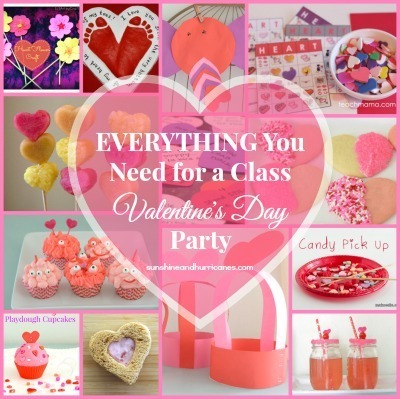 I love parties and it would be fun to throw one for Valentine’s!